Why do intelligence agencies think it's acceptable to identify our humanitarian doctors, nurses and midwives as a threat to national security? 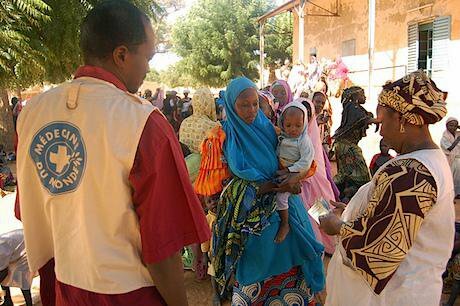 A Médecins du Monde operation in Niger. Doctors of the World UK/Martin Courcier. All rights reserved. I was in a Brick Lane restaurant on our Christmas work night out when I received the email from someone purporting to be a Guardian investigative journalist. My colleague reassured me, “it’s spam, ignore it,” and so I ordered some more poppadoms and tried to do just that. But I had some niggling questions: what would be the point of spamming in this way? If it was a scam, what could they gain? The next morning I rang the Guardian to speak with the journalist. It was him, the email was legit and what he was about to tell me would send the next few days into a whirlwind. He would not go into fine details but files leaked by Edward Snowden suggested several humanitarian organisations, including the one I work for, Doctors of the World (Médecins du Monde) had been secretly monitored by British and American security services, GCHQ and the NSA respectively. He asked if we had anything to comment. My first thought was if I’d said, written, whispered, posted, noted or insinuated anything that could be vaguely perceived as a threat to national security. I imagine this is the kind of irrational fear any person can feel when they’re told they’ve been spied on. Then he told me that it was mainly our operations in Africa that were targeted, but it still left an uneasy feeling. We do work in some quite sensitive areas, such as Mali, Somalia, and Algeria. But how could our doctors, nurses and midwives be seen as in any way a threat to national or international security? I knew they were not, and guessed this was part of blanket and overreaching snooping by the security services. They had also targeted other innocuous organisations such as UNICEF and the United Nations development programme which made us feel confident enough to put out a statement before we’d seen a response from GCHQ or the NSA, something which was not forthcoming even after the story broke. And boy did it break. It was front page news across the world including the Guardian, New York Times and the German newspaper Der Spiegel. I appeared on the BBC evening news while my colleague appeared on the ITV version. It was everywhere. We told the media that we were shocked by the allegations which amounted to a shameful waste of taxpayers’ money; money that would be better spent vaccinating Syrian children against polio, rebuilding the Philippines’ shattered health system or in any other place in the world where help was urgently needed at that time. We reiterated that our doctors, nurses and midwives are not a threat to national security and that we’re an independent health charity with over 30 years’ experience in delivering impartial care in some of the world’s poorest and most dangerous places. Our aid priorities are indeed calculated on the basis of need alone and we felt the need to make clear that this aid is never used to further a particular political or religious standpoint. Also, like other humanitarian actors, we adhere strictly to the fundamental principles of independence, neutrality and impartiality in our work and we have robust anti-fraud and anti-corruption policies and procedures in place. So why target us? This question becomes more pertinent when you consider that such clandestine and unrestrained activities could have serious repercussions for a charity like ours. Our medical professionals, many of whom are volunteers, risk their lives daily in countries such as the Central African Republic and in and around Syria. Any erosion of understanding and trust in our impartiality and confidentiality not only limits our ability to work but could put the lives of our staff and volunteers at risk. And this is the crucial point: we’re able to reach patients in need in sensitive locations because communities understand we are a neutral intermediary. If local people think we are in league with the UK or US government – or even that their information will end up in the hands of these governments unwittingly – it could risk the whole credibility of our operations in these countries. Alongside this is the huge issue of doctor-patient confidentiality. If medical surgeries are being listened in on this would be an egregious impingement on medical ethics. So it seems that GCHQ does not need to explain itself. We assume these revelations have caused the security services to no longer target our operations but without people like Edward Snowden we have no real way of knowing if they still are - or how we would be able to stop them if they were. The recent victory in the courts by Privacy International shows that GCHQ and the NSA can be held to account and that it’s the responsibility of us all to challenge any such overreach by security services when we are made aware of it, if not through the legal system then by raising awareness via the media as the Guardian and others did so well. But as for the charity I work for, we’d rather be concentrating on helping people who need us, wherever they may be. Much like mass surveillance, suffering and vulnerability is omnipresent and not going away anytime soon.